The visual multiplication table is based on Mappia’s “picture alphabet for numbers”. This means that a picture has been assigned to each of the numbers between 0 and 100. For example, the number 18 is represented by a pear. The number 18 appears in tables 3, 6 and 9, and is always represented by a pear. By using pictures instead of numbers, we are creating more connections in the brain. The Mappia methodology consists of three steps. In step 1 and 2 you will only work with pictures and positions, and no numbers. After going through step 1 and 2 you actually know that tables, and in step 3 it is verified that you can solve actual multiplication problems (such as 6×7) with the new method. The visual multiplication table is available as a printed material (language independent) and as an AppStore app (available in English and Swedish). Both the printed material and the app are fun, easy and creative to work with. Download the app MappiaMulti on AppStore (https://itunes.apple.com/bs/app/mappia-multi/id1037715029), and send us an e-mail at info@mappia.se if you are interested in the printed material. 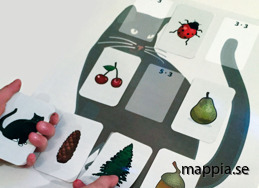 The printed material is suitable for the classroom, and it gives a multisensory experience. It is easier to interact with the printed material. The app provides you with digital possibilities, and contains all the suggested associations for both Step 1 and Step 2. It contains numerous practice opportunities, but does not include the any Memory games (as this is best played physically). Note that the app should be used under the supervision of a teacher or parent, as students who are left alone with the app tend to rush over the important work of creating associations in Step 1 and Step 2. To get the best results, it is advised to work with both the printed material and app. This can be done for example by grouping students into small groups where some work with different parts of the printed material and some with the app. For large groups of students, this may require a few sets of the printed material (discounts are given for multiple sets). For practicing between classes, the app is recommended.